I loved washing my face with the Fresh Mint Wash, the lather foamed releasing the smell of fresh mint, it was soothing and relaxing. The Micro-Dermabrasion Treatment was non abrasive revealing smoother skin and the cleansing Mint&Carrot Mask felt luxurious, the experience was a Red Carpet Facial, at home. I usually spend five minutes removing masks and scrubs from my skin, I loved how the warm water instantly removed the product from my skin, completely melting it off, leaving my skin fresh and clean. This Red Carpet Facial is truly a treat, it is one of Malibu’s best kept secrets, it’s been a cult favorite for the past 30 years. 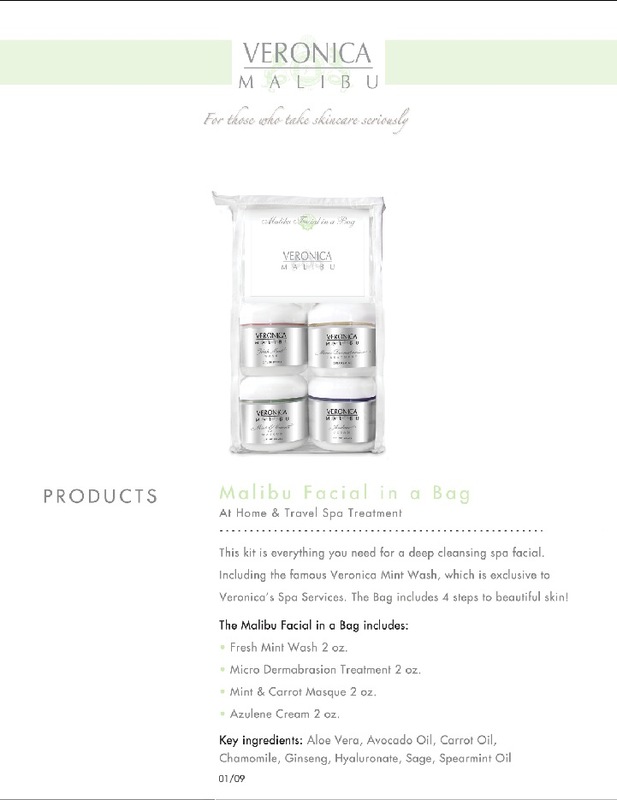 Malibu Facial in a Bag is basic skincare that shrinks pores revealing smoother and softer skin. Fresh Mint Wash – Instantly softens tap water, leaving your skin like you just had a professional facial! Micro-Dermabrasion Treatment – gently exfoliates the skin, minimizing fine lines, wrinkles and pores. Stimulating the production of new and healthy skin. I’m ready for my close up! Mint&Carrot Mask– A refining facial mask that tightens pores, refines skin texture and calms irritations. The carrot oil provides nourishment, leaving your skin prepped for the red carpet! P.S The longer you leave the mask on, the more it removes dead surface skin!!! I’m in love! I normally don’t believe in toners, but the Cucumber Toner soothed and calmed my skin irritations, I recently had a few beauty mishaps, I tend to not always follow directions and found this toner soothing for my current sensitive skin. Once my facial was complete I applied the Azulene Cream, it’s a protective cream that prevents inflammation, pimples, blackheads and whiteheads, promoting clear skin. Malibu Facial in a Bag gets a TEN! *Don’t leave the mask on longer then 30 minutes!